If it’s Friday it must be a day to run graphs (hey, it’s been a while!). 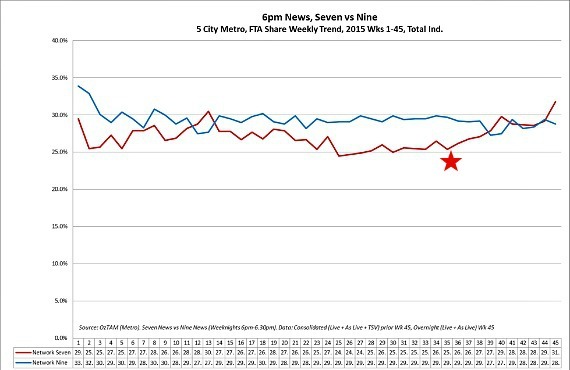 This week Seven sent through their latest graphs that show how Seven News has improved since the arrival of The Chase. Since launching in mid September the show has repeatedly defeated Hot Seat in the 5:30 timeslot. Last week The Chase averaged 622,000 viewers at 5:30pm over Hot Seat 554,000. At 5pm, when there are fewer viewers at home, it was 399,000. Would the Seven show still win if it was a single number? Possibly not. But Nine has happily defended its splitting of its own one hour News, so it could be a case of be careful what you wish for. The real lifting of course is not in the 5:30 slot itself but in delivering further eyeballs to the primetime 6pm News. The Chase is doing just that. 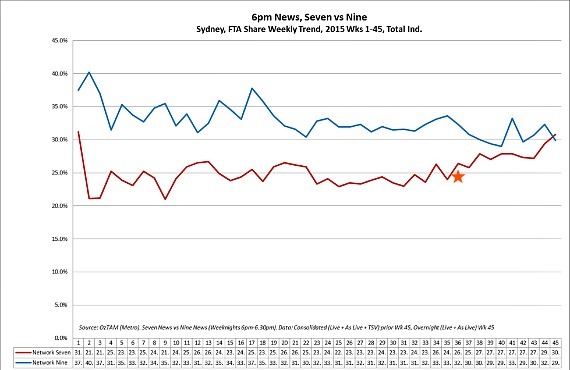 The top graph illustrates Seven News v Nine News for the first half hour of News across the Calendar year (incl. non-ratings). I’ve added a star so you can see where The Chase begins. The graph appears to end at Cup Day, when Seven has strong viewership. The below graph shows the same data for the Sydney news bulletin. Seven did not supply the same for Melbourne, which would have favoured Nine. Initially, some readers were quite vocal about Andrew O’Keefe in the hosting role on The Chase but the figures show it is doing its job. After watching the Chase in the after noon from the UK, which is always entertaining especially the compare I struggle with watching The Chase Australia only because of Andrew O’Keffe. He over acts, over reacts, has the most annoying false laugh and is the most annoying person on TV. Surely they could have found some one more pleasant the him. The most important person on the show in his mind is unfortunately himself. Only watch it because of the informative content and there is not much else in that time slot. Hopefully 7 might rethink the compare soon. The person that did Million dollar minute might be an option. Pretty graphs don’t change the fact the Sydney bulletin is a train wreck. The gap between 7 and 9 in Sydney narrows for a while in the first half hour but then blows out. Now they have sorted the lead in issue, time to focus on the real problems: an unappealing newsreader and crap content. Bring back Bathie. I would get ready for some big changes at the start of 2016 with Craig McPherson now at the top…..I would assume all new formats, sets and potentially a new presenter in the Sydney bulletin..
Isn’t there a quiz show on the same time as The Chase in the UK that rates equally as well? Nine should investigate. Pointless, coming soon to 6.10pm weekdays on the ABC. Important to note that the second graph only relates to the first half hour of the news. Including the second half hour would see things swing massively in Nine’s favour. I noted both graphs are 6pm only. Bah, sorry read over that. Even still, just another sneaky Seven PR graph that only tells half the story! David, do you know if Nine will makea new game show by the middle of next year if Hot Seat doesn’t improve? Heyhey_variety : Why would Nine be worried???? Its not thrashing Hot Seat. Yeh, because people on Facebook hate Andrew O’Keefe!